This is a must buy for everyone who would like to get the most out of your Seoul trip! Please download the Discover Seoul Pass app on your phone and all the information will be there, with real time tracking and general information of the places you visited. ※ Please purchase preschool child's ticket on-site. ※ Please purchase preschool child's ticket on site. This is the Discover Seoul Pass BTS Edition. Pick-up is available until 31st December, 2019. Please reserve as soon as possible as it is very popular! T-money enabled Discover Seoul Pass Card offers free admission to 35 locations and additional discounts in a limited time. Special benefits only for foreign visitors. Enjoy your trip to Seoul with just one pass! Discover Seoul Pass is a tour pass card, allowing foreign visitors to enter attractions without waiting in lines, for the limited time. Even after the time is up, you can still get up to 50% off at concerts, duty-free shops. Moreover, T-money, transportation card function is added on the card, you can use buses, subways, taxi, etc without buying a separate transportation card. • Discover Seoul Pass BTS Edition, don't miss your chance to order! 1. Free admission to 35 major attractions in Seoul. - 10 ~ 50% off at 30 tourist sites regardless of card limit time. - Immediate discounts for showing the card at the ticket booths or windows. - Provides attraction information and locations and nearby attractions’ information based on the pass holder’s location. - Can use it as a transportation card, T-Money, after top-up. ※ Check out the Attractions with Free Admission for more details. ※ Check out the Special Discount Benefits for more details. 3. This card becomes active immediately and countdown starts after visiting the first attraction. 4. Show your card to the ticket box at each attraction in exchange for entrance tickets! 1. The time limit of this card becomes active immediately after visit one of the free attractions with the pass. 3. If you visit a tourist site using Discover Seoul Pass, you must bring a physical card with you. You cannot use it without a physical card. 4. The business hours or holidays of each attraction may change depending on their internal conditions. Please check the opening hours before visiting. 5. Check for free admission to palaces / art galleries on the Day of Culture (last Wednesday of the month (as of 2016)) by government policy and age benefits (such as the age of 65 or older) and use the card efficiently. 6. Information on the use of Discover Seoul Pass or the franchise tourist attractions may change without notice. 7. Details can be found on the homepage or Discover Seoul Pass or Smartphone application. 8. We do not hold responsibility for any disputes regarding the use of Discover Seoul Pass purchased from non-registered retailers. 9. Once the QR code on the pass is damaged, you cannot use it. We do not hold responsibility for any damages. Please take good care of the card. 1.T-money transportation function is not supported with Discover Seoul Pass BTS Edition. 2. Discover Seoul Pass BTS Edition is only available as 24 hour pass. 3. Discover Seoul Pass BTS Edition is exclusive for foreigners, but not to Koreans. 4. 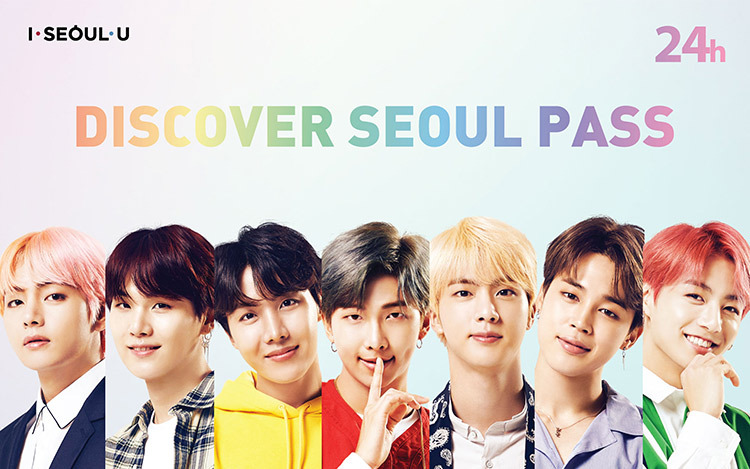 Pick-up of Discover Seoul Pass BTS Edition is available until 2019/12/31. Q. What happens if I didn’t pick up the card? A. If you didn’t pick your card up due to external reasons, such as flight delay, please check the operating hours of the pickup places and pick up the card on the desired date and on the desired place. However, you must bring a mobile voucher (email voucher). Q. Where can I get a refund on the transportation card bill? 3) If the balance exceeds 50,000 KRW, please visit Korea Smart Card T-Money Town. Q. What is the expiration date of Discover Seoul Pass? A. In case of non-used (non-activated) pass, the valid period is five years from the date of issue. (Date of issue is written on the back of the card) However, there is no limit in period for T-money function. Q. How do I get a discount on performance / Duty-Free Shops? A. You must present a physical card on the spot.